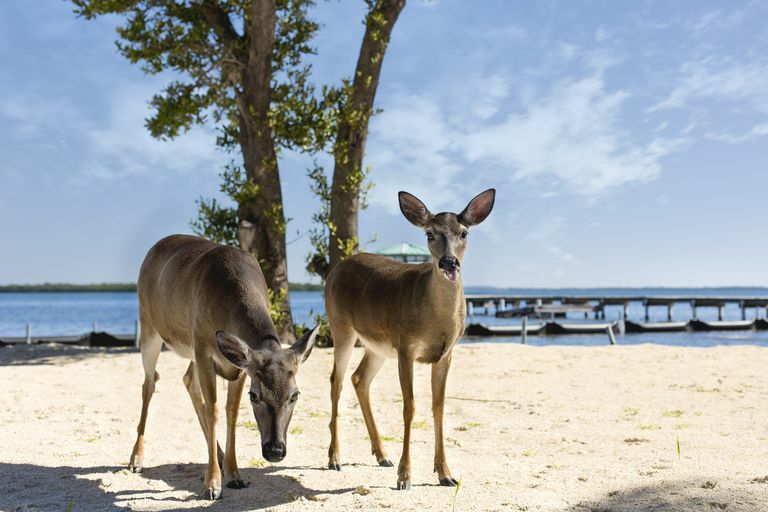 Between palm trees, Bambi deer, sandy beaches, and warm waters, the Florida Keys usually sounds like a magical place. But in autumn 2016, an unwanted visitor, the screwworm, began creating problems for pets, livestock, and ranchers, especially because the deer found in the Florida Keys are endangered animals. Yet from the herd of 1000, already close to 10 percent have been put down because of these painful infections. Experts are digging deeper into understanding this parasite, its effects, and most importantly ways to stop it. The screwworm arrives as a fly. It's about the size of a regular old housefly but looks a bit different—it has orange eyes and a metallic looking body that's blue, green, or gray with dark stripes. This fly begins to cause problems when it lays its eggs. The female flies lay their eggs on a wound's edge (or sometimes other openings like the mouth or nose). The eggs hatch within a day of being laid. The baby flies—the larvae—then dig into the wound, using it as food. This is called myiasis. In other words, this is a maggot infestation, but unlike most other maggots this type lives on living flesh, not dead tissue. It's also pretty painful for animals as the larvae dig and eat into the wound tissue. It can turn a small scrape into a deep, painful, burrowed wound. The larvae then leave the wound in less than a week, pupate, and become flies, restarting the whole process. A wound that is infected becomes even more attractive to mother flies. More eggs will be laid in the same wound, making an animal even sicker. Eventually, infected animals can die from this. There's both a New World and an Old World version of screwworm. The New World screwworm is called Cochliomyia hominivorax. The Old World screwworm is called Chrysomya bezziana and has been found in other warm areas, in Asia (particularly South Asia and Southeastern Asia), Africa, and the Middle East. Where Are the Screwworms Found? Screwworms are still found in South America and in some parts of the Caribbean. The countries the U.S. government considers affected include Argentina, Bolivia, Brazil, Colombia, Ecuador, Haiti, Jamaica, Paraguay, Peru, Uruguay, and Venezuela. The screwworms can always be reimported from other countries. You may find having your bags checked annoying, but this is one of the reasons why there is so much work to prevent meat and animals from traveling un-inspected through international customs. There is always the chance that a pet or livestock might carry the fly or its larva back into the country. Screwworms probably first arrived in the U.S. from South America in the 1800s. Screwworms were eradicated from the U.S. in 1966. That is to say, self-sustaining populations of screwworms were last seen in the U.S. in 1966. There were still screwworms in the U.S. until 1982, however. Screwworms entered largely from Mexico into Texas and then spread further each year. No cases were seen in the U.S. outside of Texas since the 1970s and no wild cases have were reported in the U.S. since 1982, when the last six cases were reported in Texas. There is an attempt to keep the Panama Canal as a gap over which the flies cannot spread from South America to Central and North America. That's not to say there are never cases seen in the U.S. Sometimes someone returns with a pet from another country that is infected. In May 2010, a pet dog was noted by veterinarians to have carried the infestation from Venezuela to Florida. The area was thoroughly treated after that incident. Before 1966, these pests were a big problem for ranchers and others with livestock. The screwworms used to live in warm climates in the U.S. Depending on how cold it got over the winter, these pests could survive in some of the warmest states all year round—Florida, Texas, Arizona, and California. After winter, the flies would spread during the spring, summer, and fall. Each generation of the fly could inch further north, as they spread up to 80-160 km in each generation. By the time colder weather came, they could sometimes reach into the central parts of the U.S. and it's even thought that they were reported along the border with Canada. Screwworms usually infect livestock and livestock can be worth a lot. In Florida alone, the industry is worth over 2.5 billion U.S. dollars. It's an industry the state wants to economically protect. Other states do as well, of course. Screwworm infections can result in the loss of livestock, plus these infections can cost a lot of money through treatment and prevention measures. If screwworms spread and infect livestock in the U.S. they could cost the livestock industry hundreds of millions of dollars. A small outbreak contained in Mexico in 1992 and 1993 cost millions of dollars. We certainly don't want to see a big one. Screwworms were originally eradicated from the U.S. by releasing sterile male screwworm flies, starting in the 1950s. Florida is repeating what worked over 50 years ago. The state began in October 2016 to release sterile flies again. The hope is that the sterile flies will mate with the females, resulting in fewer eggs being produced, as many females will not have successfully mated. It takes a lot of flies. Experts had to produce millions of flies each week to keep up with the need or else they wouldn't 'drown out' the normal male flies. There was a cold winter in 1957-8. In Florida, researchers and the government released two to 14 sterile males a week and saw the reach of the screwworms drop. They then upped their production of sterile males making 50-75 million sterile flies a week. This is a bit like mosquitoes and the plans to rein in mosquito-borne diseases like Zika, Dengue, and Chikungunya. Governments and researchers have been looking to find ways to prevent mosquito-borne diseases from spreading and have looked to harnessing this idea. There have been many who have supported the use of genetically modified sterile male mosquitoes or the use of Wolbachia to affect mosquito populations. Besides eliminating the flies and using insecticide, it also may be important to avoid allowing animals to have any wounds that might create a nest for these eggs. There are a number of livestock practices that can lead to wounds that flies may use for egg-laying. These include branding, shearing wool, dehorning, and castration of animals. It's also a good idea for animals to avoid ticks. Tick bites can be the initial spot where eggs are laid. The spread of ticks in Texas actually meant that screwworms persisted in the 1970s longer than they might have otherwise. Finally, there is also a quarantine for Key West, imposed by Florida (and Georgia). This is to avoid letting animals that are infected allow for the spread of these pests. There are checkpoints to keep animals that might be infected from passing out of the affected areas. In the cases where infection does occur, certain chemicals when applied to the infected wound can kill the larvae. It usually requires treating the wound for two to three days in a row and then removing the larvae afterward (say with tweezers). Some also using dipping or spraying of animals with an insecticide to protect again the fly for seven to 10 days. Screwworms can—and have—affected the wounds of pets and stray animals, just like they can affect livestock animals. Screwworm infections have been identified in cats, dogs, and even pigs in Florida in the 2016 outbreak. Initial cases are often identified in pet animals. The wounds can be treated and the larvae can be removed, but it's best to avoid this. It's painful for a pet and can even be a devastating infection. If you have a pet, keep your pet's wounds covered and don't bring them to areas where there are screwworms if you can avoid it. If you adopt a pet from outside of the U.S. or bring your pet to travel with you outside of the U.S. it's important to have a vet check your pet, especially if there are any painful wounds. This happens occasionally, but overall it shouldn't be a worry. At the same time, keeping wounds covered is always a good idea, and an even better idea if you're in an area affected by screwworm infestations. In the rare case of an infection, the infections can be treated and the larvae eliminated. North Carolina Dept of Agriculture. Screwworm. FAO. Screwworm control and eradication in the southern United States of America. California Department of Agriculture. Screwworm.